Why Does My Dog Need a Heartworm Test if He is on Prevention? Home•Why Does My Dog Need a Heartworm Test if He is on Prevention? Heartworm tests are recommended on a yearly basis for dogs. They are required in order to refill your heartworm prevention (If you are getting your heartworm prevention from a website that doesn’t require a current heartworm test, find somewhere else to get your medication from. They are likely not a trustworthy source). 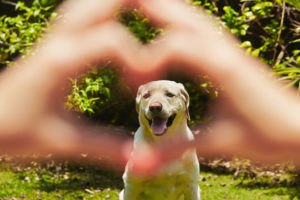 However, I am often told by clients, “My dog doesn’t need a heartworm test, he is on prevention.” Here are three reasons why your dog needs a heartworm test every year, even if he is on heartworm prevention. First, not everyone is perfect and people sometimes forget to give their pet the medication. The husband may have thought the wife did it or vice versa. Even just one missed dose puts your pet at risk for developing heartworm disease. Second, some pets can vomit up or spit out the medication without the owner ever knowing it. I heard a story of a woman that moved her sofa one day and found about a year’s worth of heartworm prevention tablets behind the sofa that the dog spit out without the owner ever knowing. The third reason is that there is no heartworm prevention that is 100% effective, even though they all have very high efficacy rates. Even with perfect use, there is still a slight chance of infection. The women reading who have ever been on birth control pills can relate to this. Even if you never miss a pill, there is still a 1% chance you can get pregnant. Hopefully that sheds some light on the reasoning behind yearly heartworm testing even if your pet is on heartworm prevention. Now when your vet tells you it is time for your pet’s heartworm test, you can agree without hesitation because you fully understand the reasoning. If you need to schedule a heartworm test for your dog, please give us a call at 706-671-1900 or click on the “Appointment” button at the top of the screen. We are pleased to partner with you in keeping your pet happy and healthy!